Transitioning to a leadership role can be a complex and often stressful experience for new and experienced leaders alike. That’s why all leaders can benefit from the strategies and tips that Michael Watkins discusses in his book The First 90 Days: Proven Strategies for Getting Up to Speed Faster and Smarter. 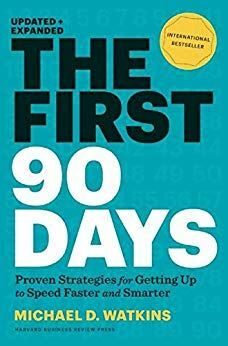 The book is written for all leaders and provides a roadmap of strategies that can be used during the first 90 days in the new leadership role. The author provides real world examples in each chapter to help illustrate the main points of that chapter and show the reader how the strategies can be used to solve the problems that many new leaders experience. One strategy discussed is preparing yourself for the new role by doing research on the organization if starting at a new company or business unit if staying within your existing organization. Understanding the current culture, cultural norms, and many of the current ways of doing things will help as you step into the new leadership role. Another strategy that is stressed throughout the book is taking the time to learn about the organization, people, and processes before making major changes. We often make assumptions based on our past experiences and what worked well in your previous role or at your previous organization may not work today. Taking the time to do your due diligence before making changes can help to avoid offending your new team and organization. I listened to the audio version of the book which was good but there are many tables and figured referenced throughout the book that are not fully explained in the audiobook. Being able to review the table and figures in the print or Kindle version of the book would add an extra level of information that was not found in the audiobook.